The German deli nearest our house is closing. Although some items are easily found these days (pretzel rolls have become much more popular of late), we will sadly lament the passing of local Leberkäse. 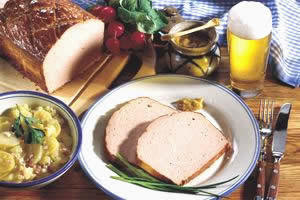 Leberkäse, the best German comfort food. Although it literally means “liver cheese,” it has neither liver nor cheese in it. It’s impossible to explain what this rare delicacy is without making it sound revolting. It’s sort of a bologna/meatloaf concoction. A giant loafy hotdog-textured meat blob without a casing. Mmmm. Leberkäse. At any rate, I plan to be filled with self-pity and lounge around the house sighing loudly for the remainder of the decade. Oh woe, oh woe is us. Can't your heritage and your fleet of kitchen gadgets collaborate to create your own version of this German classic? Ok, just a little repulsed here. But I feel your pain. I know I'm a heretic, but I've never been that big a fan of Leberkase. Still, losing the Deli is bad news. If only we had a German deli anywhere near us. It is so simple, go to Paulina Meat Market, 3501 N. Lincoln, Chi. Loads and tons of it.